After the weekend storm, Jenny and I headed over to Moor Green Lakes to chainsaw trees blown across the paths. 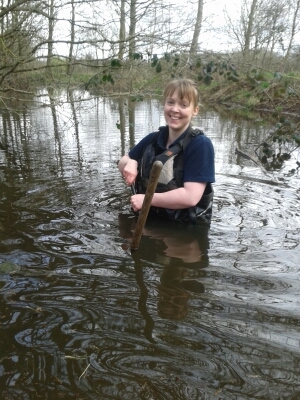 Jenny took a quick break to wade into a flooded ditch to clear a blocked culvert with pipe rods. So a perfect photo opportunity. Also thank you to Roger who organised a task over the weekend to cut the reeds and open up the view from Grove Hide. This entry was posted in Conservation, Moor Green Lakes, River and tagged BV path, Moor Green Lakes. Bookmark the permalink.